Starting in 2003, Concerts at the Point began assisting local music directors and teachers to sustain music education and enrichment. Initially we drew on performers from our concert series and other musicians to make presentations in schools. 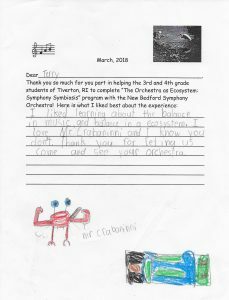 In 2013, we started working with the New Bedford Symphony Orchestra’s exciting Education Outreach Program. We now support their “Learning in Concert” programs in elementary schools in Tiverton, Westport, Fall River and Somerset. This past school year, more than 1200 elementary school students in those four school systems participated. The NBSO uses a concept-based integration model for its educational curriculum geared for grades 2-5. Each year, their programs are linked by a fundamental concept that is shared between classical music and other subject areas in the school curriculum. Concepts presented in the past include Symmetry, Contrast, Adaptation and Gravity; for 2017-2018, it was Balance in an orchestration and in the environment. See the video below demonstrating this year’s theme, methods, and results, and one of the thank you notes to Terry Wolkowicz, the wizard behind these programs. Special thanks to the John Clarke Trust and the Rodgers Family Foundation who have provided significant gifts in support of these school programs.